The second Invictus Games, presented by Jaguar Land Rover, are closing today after an amazing week that demonstrated the power of the human spirit and importance of sport to wounded, ill and injured servicemen and women on their recovery journeys. Almost 500 competitors from 14 nations inspired the world with their Invictus spirit. Invictus means “unconquered” and thousands of fans saw in person – and millions more on television -men and women who refuse to be defined by their injuries. Arriving in Orlando with a fitting ribbon cutting ceremony at the competitors village hosted at the Shades of Green Resort, the only Armed Forces Recreation Center in the continental United States, each day thereafter for the week featured different sports, celebrity attendees, and medalists, but one thing was consistent – the inspirational Invictus spirit. Invictus Games Orlando 2016 featured a lot of firsts including a new sport, wheelchair tennis; a new participating country, Jordan; more competitors and a committed focus and dialogue on helping our wounded warriors rehabilitate. But the number of medals, nations, and days of competition cannot measure the impact of the Games for competitors and their families. “I would like to thank all the competitors, their friends and families, the spectators, the volunteers and all the hard working members of our organizing team who helped shine a light on the sacrifices of those who defend our freedom,” said Ken Fisher, Chairman of the 2016 Invictus Games Organizing Committee. Cheering crowds did not break applause between a first place and last place finish; coaches shared stories of teamwork and dedication; competitors helped each other cross the finish line; family members traveled the world to continue to support their loved ones; spectators shared stories about how their were inspired by the Games and advocates came together for an open and candid discussion about the impact of invisible wounds. Families of Invictus Games 2016 competitors were offered accommodation at the Coronado Spring Resort and treated to unique experiences, allowing them to develop relationships with other families in similar situations. The competitors character, grit and determination, embodied the I AM emblem in the Invictus Games Flag that traveled the country before arriving in Orlando. For example, U.S. competitor Elizabeth Marks who gave her medal back to Prince Harry to give to the Papworth Hospital team in England as a gesture of gratitude for saving her life during the 2014 Games in London. The Aussie sportsman Mark Urquhart, who won three gold medals in track, led the grueling 1500m until the last 20m where he, in a fantastic display of sportsmanship, reached back and pushed his American competitor into the lead, giving him the gold medal. Ulfat Al-Zwiri, the only female competitor from Jordan who received a standing ovation from fellow competitors and the crowd as she valiantly crossed the finish line several meters behind the rest of the field in the women’s 100 meters dash. Gold medalist Marion Blot from France who embraced Sarah Rudder after taking a tumble in the 200 meter steps away from the finishing line. The Invictus Games Symposium on Invisible Wounds was hosted by President George W. Bush. The Invictus Games Symposium convened warriors, experts and community partners to address the scale and scope of invisible wounds (Post-Traumatic Stress and Traumatic Brain Injuries) facing warriors. With representatives from all fourteen nations participating, discussion included barriers to care, including both stigmas and stereotypes associated with these injuries. The Invictus Games Orlando 2016 will come to a close this evening with a Closing Ceremony that will feature musical performances by best-selling country vocal group of the past decade Rascal Flatts, American sensation and former “American Idol” winner Phillip Phillips, Florida native and Grammy-nominated hip-hop superstar Flo Rida, “The Voice” Season 9 winner Jordan Smith and the first nationally-recognized wounded warrior band, Vetted. 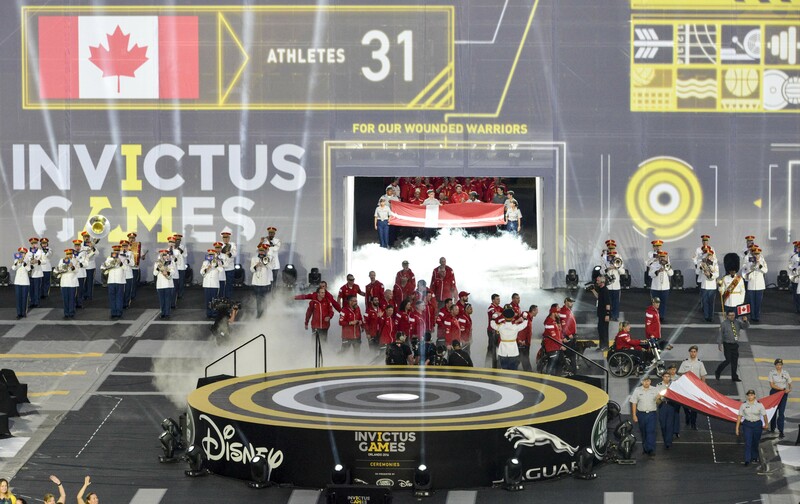 Throughout the course of the Games, ESPN has aired 55 hours of dedicated Invictus Games Orlando 2016 coverage across ABC, ESPN, ESPN2 and ESPN3 with a projected 10+ million viewers. Over the next few days the excitement may die down, but the support system and relationships built at the Games will continue to 2017, and last forever. Presented by Jaguar Land Rover, the Invictus Games are the only international adaptive sporting event for injured active duty and veteran service members. The Games use the power of sport to inspire recovery, support rehabilitation and generate a wider understanding and respect of all those who serve their country as well as their families and caregivers. Almost 500 competitors from 14 countries competed in 10 adaptive sports. The Invictus Games Orlando 2016 are presented by Jaguar Land Rover. The Official Supporters are the Walt Disney Company, Fisher House Foundation, Fisher Bothers, Sage, Coca-Cola, Deloitte, Wounded Warrior Project, Experience Kissimmee, Capital One, Invacare and Ottobock. The George W. Bush Institute conducted an international symposium at Invictus Games Orlando 2016 on May 8, to discuss solutions aimed at helping returning servicemen and women improve outcomes for their transition back to civilian life. President Bush also served as honorary chair for the Invictus Games Orlando 2016. The Invictus Games Symposium on Invisible Wounds convened warriors, experts and community partners to address the scale and scope of invisible wounds (Post-Traumatic Stress and Traumatic Brain Injuries) facing warriors. With representatives from all fourteen nations participating, we discussed barriers to care, including both stigmas and stereotypes associated with these injuries. Luxury British automotive manufacturer Jaguar Land Rover is proud to be the presenting partner of the 2016 Invictus Games Orlando, the international sporting event for wounded, injured and ill servicemen and women using sport to inspire recovery, support rehabilitation and generate a wider understanding and respect of those who serve the country. Since 2013 Jaguar Land Rover has hired over 200 former servicemen and servicewomen in the UK, working closely with the Career Transition Partnership, the Ministry of Defence’s (MoD’s) official provider of Armed Forces resettlement. Details of a Jaguar Land Rover Veteran recruitment programme in the United States will be announced ahead of the Games.